Placed over your existing mattress, our Memory Foam extra long toppers conform directly to your body and provide a wonderful night's sleep. They also reduce discomfort or tossing and turning. This visocelastic foam is five times denser than regular foam and will allow you a restful nights sleep at a cost much less than the comparable Nationally advertised brands - and now in extra long sizes. The foam color may be off white or blue. 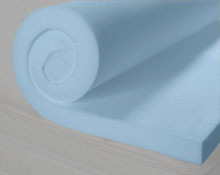 Our extra long memory foam toppers work for all extra long mattress sizes up to 90" long. Our toppers are 2", 3" or 4" thick to meet all of your needs. The 90" toppers work great with our Extend-a-Bed, too. We also carry extra long sheets, extra long mattress pads, extra long blankets and extra long comforters to accommodate the additional thickness and length of your long mattress.